Pysny means proud and it is no coincidence this peak got such a name. Pysny Peak stands proud overlooking Mala Studena and Medena Valleys. The ascent is demanding and suitable only for experienced mountain tourists accompanied by a mountain guide. 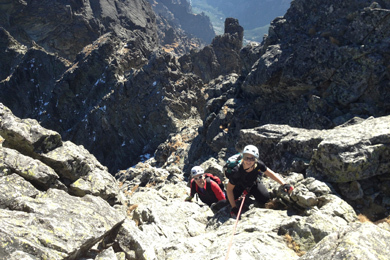 The view from the top mostly reveals the neighbouring Lomnicky Peak (the second highest in Slovakia) but also the east and west sides of the High Tatras. The ascent begins and ends at Tery’s Hut high up in the Mala Studena Valley. It leads via Maly (small) Pysny Peak to the main summit. The climb is quite difficult and technical and we recommend attempting it only for experienced tourists with a mountain guide. The location of Pysny Peak allows for captivating views from its summit – the neighbouring Lomnicky Peak seems to be literally in your hands. More spectacular views are towards the west part of High Tatras and the down on the entire Mala Studena Valley with its beautiful Spis Lakes. In the past, Pysny Peak beard a name of “Lastovicia Tower” after a small bird. Today, its name derives from its “proud” shape. 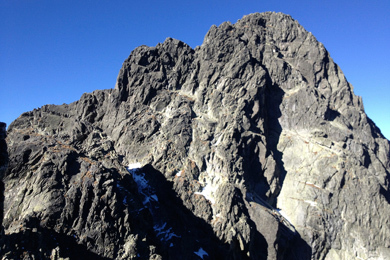 Pysny Peak was considered as a smaller summit of Lomnicky Peak for a long time. 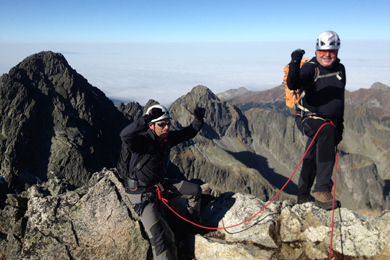 The first people to summit it were Edmund Téry with a mountain guide Martin Spitzkopf on August 8, 1877. They left a written record of their achievement in a bottle at the summit rock. On August 9, 1924 a tragedy struck high up on Pysny Peak when during a rescue mission of an injured climber Jan Breuer, a mountain guide from Nova Lesna, died.